I've mentioned time and again that I suffer from bouts of splotchy redness in my skin. I'm lucky in that I don't get many blemishes, but the redness sometimes can drive me absolutely crazy. I feel as if I may have developed a bit of rosacea in recent months. I've managed to gather quite a bit of products that really help to tone down the redness and get me on my way to even skin again. The Midday Soother | I've mentioned the Glossier Soothing Face Mist several times on the blog before, but it really is my favorite face mist. Though pretty much all of the mists I've tried feel quite refreshing and soothing on the skin, this one really does calm it down when it's having an angry red flare-up. I had a phone interview a few weeks ago and the anxiety of it was literally turning my cheeks purple and burning hot. After the call I doused myself in this, and my skin quickly returned back to normal. I'm never without one in my bag now. The Soothing Masks | I'm probably going to use the word "soothing" in this post, just a heads up. I mentioned my two favorite masks for hydrating the skin and calming down redness in my Winter Skin Essentials post - the Fresh Rose Face Mask and the Belif First Aid Anti-Hangover Soothing Mask. Both are really cooling gel formulas that sink into the skin and get to work. These both feel phenomenal after a stressful day. The Fresh one feels like such a luxury with that beautiful rose scent, but the Belif one is amazingly effective at getting rid of redness, and it leaves the skin feeling so dewy afterward. If my skin is feeling both red and spotty, I'll go for the Antipodes Aura Manuka Honey Mask. This is probably my favorite mask of all time, as it just does everything - cleanses, hydrates, and soothes. I love this one after a long day of sitting in front of my space heater. 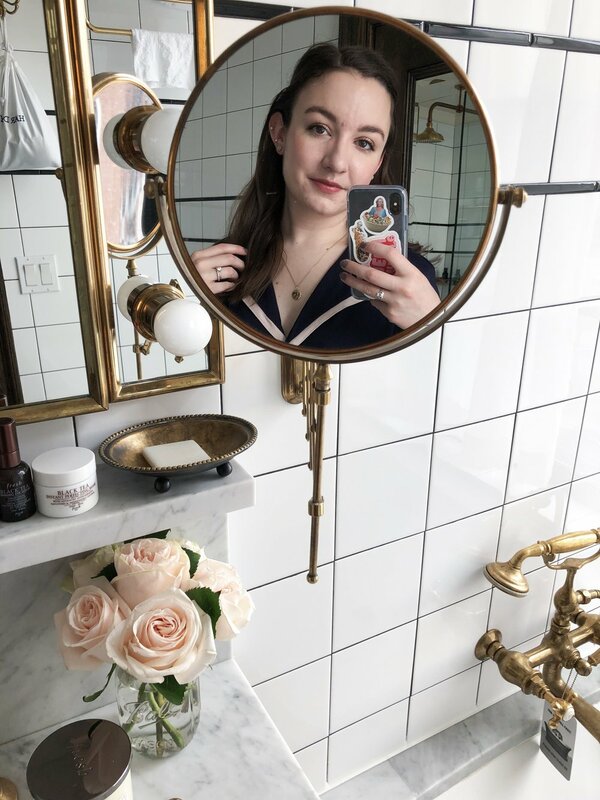 The Overnight Relief | Speaking of things I've mentioned many times before, I'm still harping on about how great the Sunday Riley Luna Sleeping Night Oil is. It's not too heavy of an oil - I'm sure it would work well on someone with more oily skin, but it's also moisturizing enough for a dry-skinned gal like me. The blue tansy it contains really helps to calm angry skin, and whenever I use this at night, I'll wake up the next morning with clearer, more even skin. It's seriously a little miracle worker in my book. The Morning Fix | Another godsend from Glossier is their Priming Moisturizer. I've lost track of how many bottles of this baby I've gone through, but it's definitely my favorite moisturizer for daytime. I use it every morning without fail, whether I'm planning on wearing makeup or not, because it just plumps everything up and magically reduces redness (Glossier says their anti-redness complex is actually a mixture of tea and honey extracts). It's such a lightweight cream but layers up over drier areas nicely, and it leaves the skin with the most glorious dewy sheen. The Camouflaging Powders | If, after employing all these skin-loving goodies, I'm still left with some redness (the sides of my nose can be quite pesky sometimes), I cover it up with some concealer set with a yellow-toned powder. Based on the color wheel, products with a more yellow tone will better camouflage redness, so even though my skin is quite pink-toned (even without the redness), I still go for the yellows. For an all over powder I just can't get enough of the Hourglass Ambient Lighting Powder in Diffused Light. This one is quite subtle, but it does take the edge off of my Rudolph nose. For more heavy duty redness I'll use the Banana powder from the Anastasia Beverly Hills Contour Kit. This is meant to be a highlighting shade, but as I'm so fair it works as an all-over setting powder. What do you reach for if you've got redness creeping on your face?